Greenpeace needed a compelling effort to pressure companies to go with a more environmentally friendly paper supplier. Greenpeace learned that Asia Pulp and Paper (APP), an Indonesian company purportedly destroying huge tracts of rainforest that are home to the endangered Sumatran tiger, had large contracts with US companies. The organization needed a compelling global campaign to communicate the damage it believed APP was doing and pressure the companies involved to switch to a more environmentally friendly paper supplier. Greenpeace targeted Mattel due to its high visibility. The company was wrapping its toys with paper from APP. Mattel's Ken and Barbie brands were effectively hijacked to serve as the face of the campaign. The initiative launched globally on June 7, with the main efforts focused on Mattel's global headquarters in Los Angeles. Utilizing guerilla campaigning tactics, a team of professional climbers dressed as Ken in light blue tuxedos scaled the Mattel building and unfurled a large banner over the side of the building with a frowning Ken which read, “Barbie, It's Over! 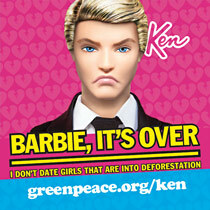 I don't date girls into deforestation” and gave the URL to Greenpeace's campaign microsite. A Greenpeace member dressed as Barbie drove up in a pink mini-bulldozer with the intention of passing information to Mattel employees, but she was arrested before she could reach the building. Similar scenes were occurring across the world. A banner was unveiled in Piccadilly Circus in London stating, “Barbie, You're Dumped!” In Finland, activists placed stickers on Barbie packages in stores stating, “Warning! Packaging may contain destroyed rainforest.” Greenpeace members dressed as Barbie and endangered Sumatran tigers protested outside of a Toys “R” Us in Taipei, Taiwan. Behind the scenes, Greenpeace was simultaneously rolling out material online. Information and photos regarding APP and efforts undertaken by Greenpeace activists from around the globe were posted in real time on multiple media outlets including Flickr, Twitter, and Facebook. Greenpeace went live with its microsite dedicated to the campaign, which includes a short animated film of Ken learning Barbie has secretly been killing Sumatran tigers and ultimately deciding to leave her. The video was translated into 18 different languages and posted on media outlets including YouTube and Vimeo, garnering more than 2 million views by the end of the campaign. Greenpeace eventually contacted the individual owning the handle to enrich the communication between the two accounts. “We are constantly looking for ways to innovate once a campaign is launched and create material that is new and reactive,” explains James Turner, media officer for Greenpeace US. Nearly 10,000 followers were gained as the two spoof accounts interacted. Through all media channels, Greenpeace asked supporters to call or write to Mattel and ask it to cut ties with APP, offering the necessary address, phone number, and link to do so. Shortly after the campaign's launch, Mattel temporarily shut down its commenting stream. The story received global coverage from large media outlets in many countries and across the US, including five articles in the Los Angeles Times, and exposure from ABC, CBS, FOX, NBC, The Guardian, Huffington Post, Time, and Reuters (UK, US, and Indonesia). On October 5, Mattel announced it had discontinued working with APP. Later that month, Hasbro said it also had found a new paper supplier. When it comes to the toy industry, Turner believes that “it has largely taken the steps we feel it needs to.” While Greenpeace cannot disclose future campaigns, he warns that “any company with connections to APP may possibly be targeted, and if they choose to ignore the facts, the brand is at risk. "I'm guessing that there are a lot of creative people who would love the chance to develop ideas without the constraints that a corporate client normally imposes,” Turner speculates. “I'd like to offer an open invitation for these people to contact us, because we have the capacity and the boldness to deliver the kind of campaigns that can reach millions and shake up entire industries."